If you have some extra time while frolicking the gorgeous region of Bavaria, one of my top recommendations for you is to take a Munich to Salzburg day trip. As a girl who used to watch Sound of Music every Christmas (and every time our music teacher was too lazy to actually teach us anything), my obsession with Salzburg began at an early age. And while I now know that the Sound of Music is purely an American film that many Austrians haven’t watched/care for, it still doesn’t erase the fact that this city still looks much as it did in the film… and yes, it will make you want to stomp around, singing and twirling all over the place like an absolute maniac. 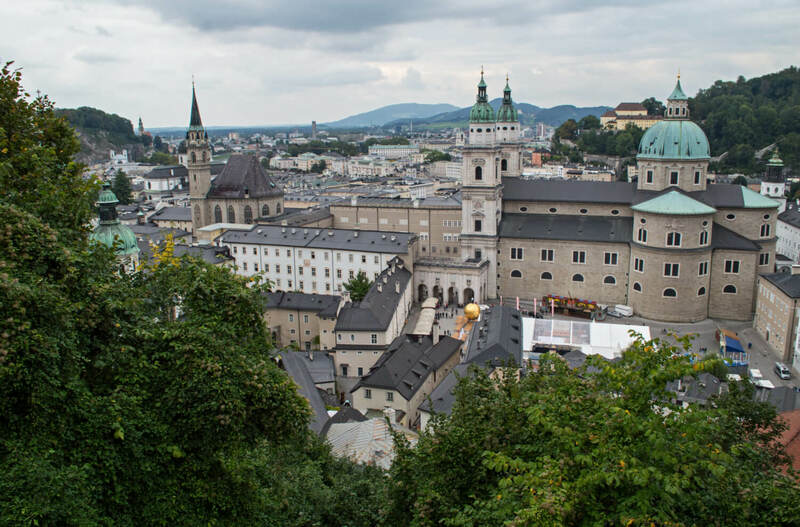 Besides Sound of Music though (and the fact that Mozart was born/raised here), Salzburg is a gorgeous city that stands out from the pack thanks to its Baroque architecture and tremendously “frolickable” streets… so much so that they’ve been a UNESCO Heritage Site since 1997. Touristy as it may be (and yes, you will be sweltering in tourist hordes), I still find a lot of charm in Salzburg, and recommend it highly as a day trip from Munich. 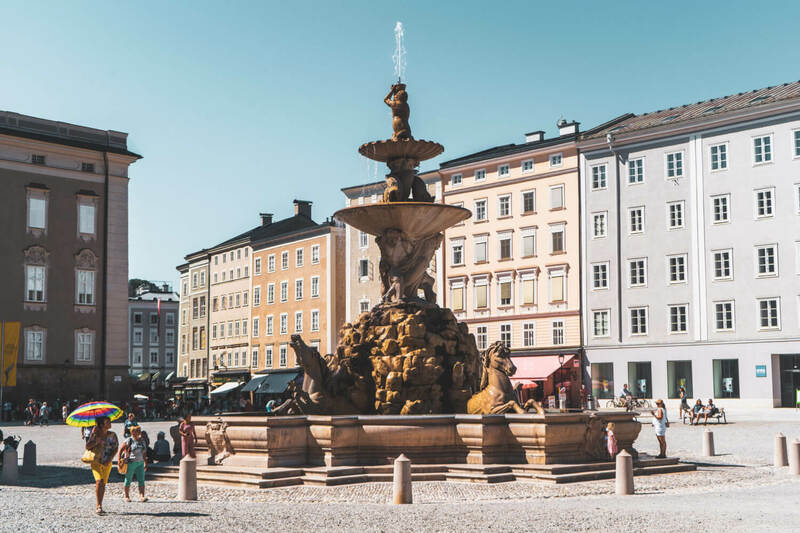 So, if you’re keen to explore the gorgeous little streets of Salzburg for yourself, this post will walk you through how to make the most of your Munich to Salzburg day trip. First – How far is Salzburg from Munich? A lot of people are surprised when they hear just how short the distance is from Munich to Salzburg. Only about 150km separate the two cities, which means a day trip (or overnight trip) couldn’t be easier. Whether by car, train or bus, you’ll be there in less than two hours. The best way to get from Munich to Salzburg is the train (in my opinion), but we’ll talk about that in the next section. To begin, you’re probably wondering how to get to Salzburg from Munich. I highly recommend using GoEuro to compare the different options – it’s free and lets you quickly sort through the different transport options (trains, buses, etc.). This is a great way to look at the different departure times/durations quickly. You’re spoiled for your choice though. 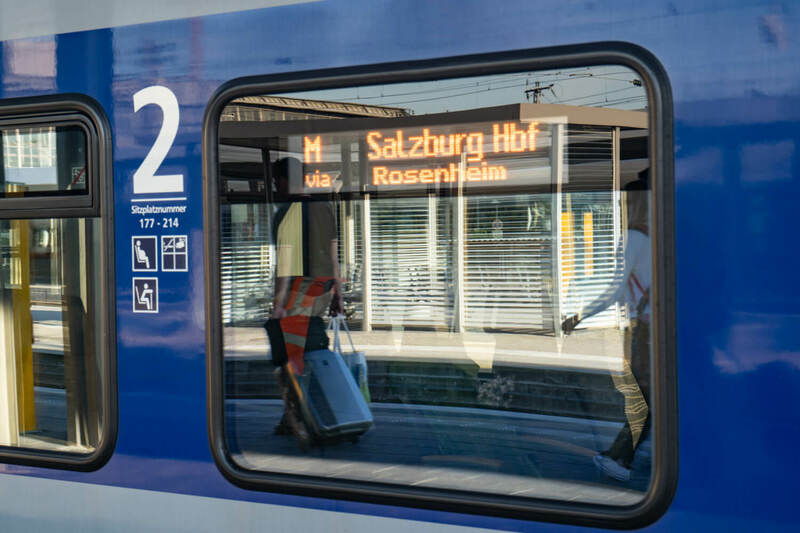 Transportation from Munich to Salzburg is frequent, quick and best of all – cheap! 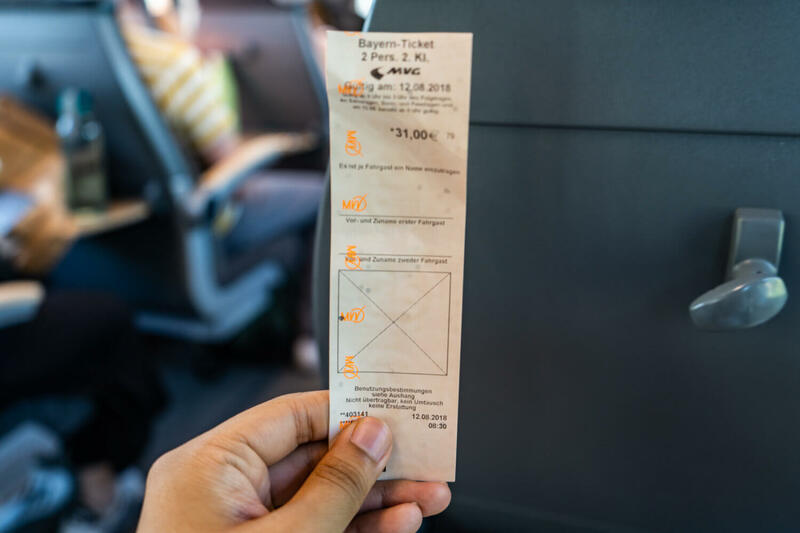 I personally recommend taking the train using a Bayern Ticket (a regional ticket for Bavaria), which grants you unlimited public regional transport all around Bavaria for a low price (25 euros for one person, 7 euros for every additional person up to 5 adults). This usually works out to be the same price/cheaper than the bus, plus it’s more convenient, relaxing and scenic. The Bayern ticket is usually only valid in Bavaria, but you can take it to Salzburg for select trains (more info on that below). Anyways, I know you like options, so here’s a detailed breakdown of how to travel from Munich to Salzburg, featuring the different transportation options and their pros and cons. Getting from Munich to Salzburg is easiest (in my opinion) by train, unless you book a tour. I really like this option because the Munich to Salzburg train is scenic and well worth the minimal extra you pay compared to a bus… especially that part when you chug across the river and catch a glimpse of the Hohensalzburg Fortress for the first time! It’s gorgeous. If you do decide to enjoy the scenic lil train ride from Munich to Salzburg, your best bet is to go from Munich HBF to Salzburg HBF (the central stations of each city). STEP ONE: Go to Munich Hauptbahnhof (AKA Munich Central Station). Trains from Munich to Salzburg depart from the Munich Hauptbahnhof (Central Station) BUT it also stops at Munich Ostbahnhof as well (the East Station) which is more convenient to reach if you’re staying in the east side of the city. I do honestly recommend just going to the Hauptbhanhof anyway though and catching the train from there because this is a very popular trip and during peak season, it gets busy so if you want a guaranteed seat during the train ride from Munich to Salzburg, you should probably get on at the Hauptbahnhof. 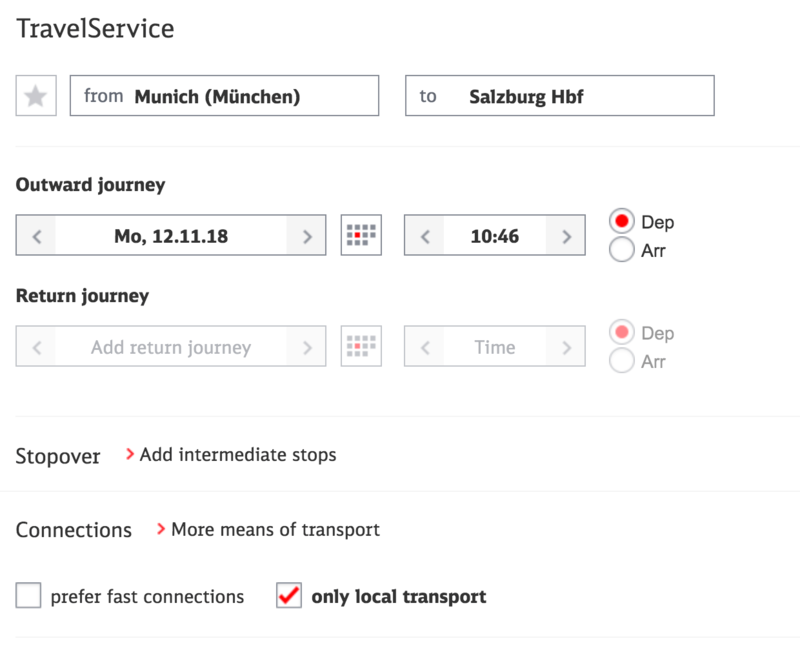 You can easily buy train tickets from Munich to Salzburg on the day-of if you follow my recommendation of getting a Bayern Ticket at one of the red ticket machines (or buy one online by clicking the red button on this page). If you are getting a Bayern ticket, know that it is only valid for regional trains in Germany. This means the trains you are looking for will be the Meridian trains designated with an “M”, not the RJ or EC trains. To double check the time table for the trains that the Bayern ticket is valid for, look for a “only local transport” box on on the DB website/app and check that. This way, you’ll only be shown trains that your Bayern Ticket is valid for. For more info, you can click here for my full Bayern ticket guide. On weekdays, the Bayern ticket is only valid from 9am onwards. On the weekend it’s 6am, so don’t book any trains that are earlier than these times or else you won’t be able to use your Bayern ticket. You can buy a Bayern ticket at any of the red ticket machines at the station where you buy Munich train tickets. Look for “DB Special Offers” and it will be called a “Bavaria Ticket” in English. You must then select the number of passengers (don’t lie, because they will check and each passenger’s name must be written on the ticket). The ticket will then be printed and you can scurry off to your platform. OR if you want a stress free method, click here to buy a Bayern ticket in advance. FYI, the Meridian trains going to Salzburg are usually in the first grouping of platforms (5-11) which are located on the far end of the station (where the Starbucks is, but further down) and require more leg work! Allow your self extra time to reach the platform because it’s a longer walk than all the trains you see just in the main area. Also, if you have time, walk to the cars at the end of the train which are ALWAYS less crowded. Don’t worry, if you’ve forgotten a pen, they’re usually quite forgiving and will let you borrow one on the spot to jot down your names. STEP FIVE: Enjoy the scenic ride to Salzburg. Another option for getting from Munich to Salzburg is to take a bus. While this might seem like a cheaper option at first glance (usually less than 10 euros per ticket), using the Bayern Ticket as I outlined above usually works out to be the same/cheaper. This is because the Bayern Ticket covers you for the WHOLE DAY and also for public transport within Bavaria, so you can get to the train station, go to Salzburg, come back, and go back to your hotel all with one ticket. The added bonus is a) there’s no chance you get stuck in traffic if you take a train and b) the scenery is nicer on the train. For these reasons, I strongly advise you take the train from Munich to Salzburg instead of a bus. That said, if you are a bus travel enthusiast (or have another equally compelling reason), here are the options. I would use GoEuro to search up the different bus times/options. At the time of writing, it seems like Flixbus is the provider, with a Croatian company called Črnja Tours servicing this route once a day as well in the early hours of the morning. I’ve written openly about Flixbus before (my honest review is here) and it’s… fine. For a short distance like this, it’ll probably be alright, but it’s definitely not the most comfortable experience when compared to a train. Buses from Munich to Salzburg will leave from the Munich Central Bus Station AKA ZOB (less than a 10 minute walk, or 1 S-Bahn stop from the Munich Hauptbahnhof). There are around 5 departures a day and the ride is 1.5 – 2 hours. Again, the driving distance between Munich and Salzburg is about 150km and so the drive will take only about 1.5 -2 hours. This makes it more or less the same duration as taking the train, so I only recommend driving from Munich to Salzburg if you plan to take the car to visit other places around Salzburg (like the Eagle’s Nest or Berchtesgaden) OR if you simply want to experience the thrill of the famous German Autobahn. The easiest and most common way is to take the A8 from Munich to Salzburg. This is a popular route so you’ll see “SALZBURG” signs all over the Autobahn – they’re impossible to miss. Again, this will take about 2 hours unless there’s huge traffic. Don’t forget to get off the motorway before you hit the Austrian border, unless you want to purchase an additional vignette (more info on this below). There’s not really any free parking in Salzburg city centre. Factor that into your costs! 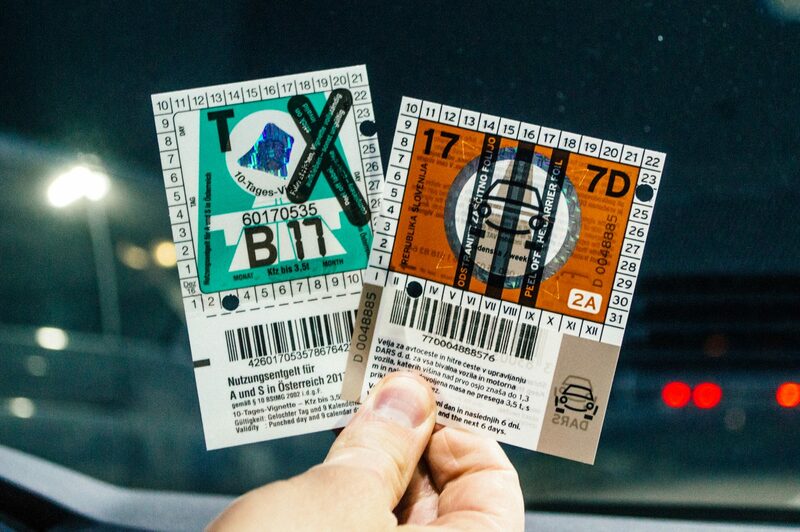 They do offer Park and Ride options where you can buy parking and an all-day transit pass for a fixed price. Learn more here. Don’t forget that there is a mandatory vignette system in Austria if you want to use their motorways. The cheapest vignette you can buy is the 10-day one that (as of 2018) is 9 euros. Don’t risk not getting a vignette – I accidentally drove into Austria once (#EuropeProblems) and got fined in the mail a month later. If you want to avoid buying a vignette, get off the motorway before you hit the Austrian border and then take smaller roads to Salzburg. Sandeman’s is the company that runs this Munich to Salzburg tour by train. I would recommend this as a good option because you get to experience the lovely train ride, with the bonus perk of having an experienced guide with you to show you around the city. I love doing walking tours with Sandeman’s all around Europe and their guides have always been great! Click here to check reviews and prices. Can you take a Sound of Music tour from Munich? I researched this extensively one day (no doubt spurred by another Sound of Music viewing) and there doesn’t appear to be any Sound of Music specific tours that run from Munich. 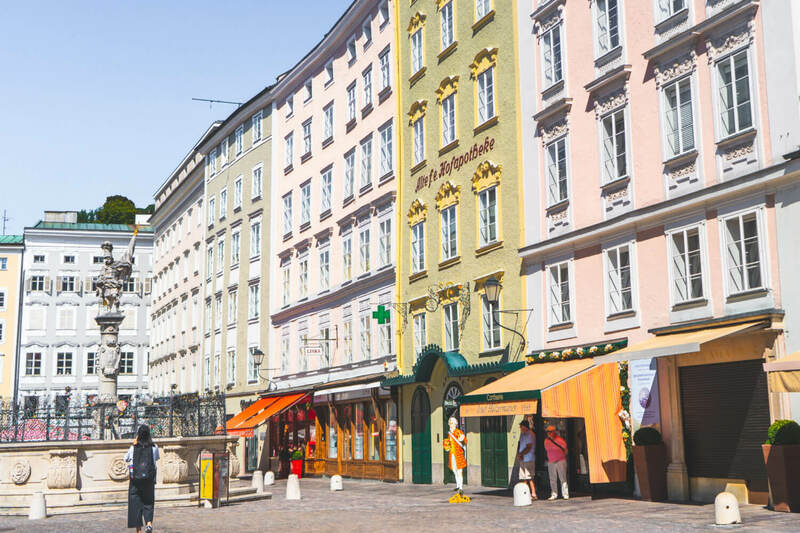 Instead, what you’ll need to do is get to Salzburg (using one of the aforementioned methods) and then book a Sound of Music tour once you’re in Salzburg. Here’s one with glowing reviews. NOTE: Be sure to read reviews and read the descriptions of tours clearly before you book a Salzburg tour from Munich. I’ve been told there’s an Austrian law that prevents German guides from “tour guiding” around Salzburg unless they have Austrian qualifications. Often this isn’t properly communicated to tour guests and so they’re surprised when they’re left to explore independently instead of getting a guided tour around. Be sure to keep in mind the Salzburg to Munich train time that you’re aiming to leave at, otherwise trust me: it’s very easy to get distracted. 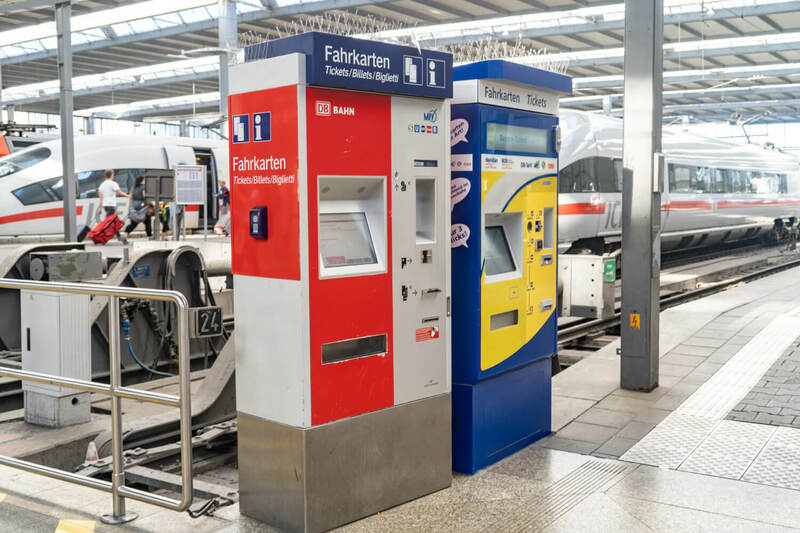 If you follow my tip of getting the Bayern ticket, you won’t need to get any new, additional train tickets from Salzburg to Munich, your Bayern ticket covers you for the whole day. I know the journey from Munich to Salzburg seems short, but you are officially entering a different country (yay you). And while Germany and Austria are both in the Schengen Zone which means there are no formal/mandatory border checks, they do happen often (especially if going by bus or car), so have your passport on you just in case. It is also likely you need an official ID to prove your identity when using the Bayern ticket, so yes, just don’t forget it. I know: “when is this girl going to stop talking about the Bayern ticket? !” I promise this is the last time… but seriously, don’t waste your money buying regular train tickets or renting a car. The Bayern ticket is a gloriously angelic invention bestowed upon us by the DB gods and you should surely take advantage of it! More money for treats later, of course. For more info, you can click here for my full Bayern ticket guide. The hiiiiills are aliiiiiive with the sound of touuuuuuurists…! Listen, I can’t lie to you: Salzburg is touristy. Possibly one of the most touristy places I’ve ever been. The city knows its selling points (Mozart and Sound of Music) and walking around can feel like you’re getting punched in the face by Mozart’s ghost himself. If you hate crowds and kitschy souvenir shops, this might not be the best destination for you. That said, like in any other touristic city, people DO live here, so there are ways to escape the tourist bustle and discover other, lesser known spots. More on that later. 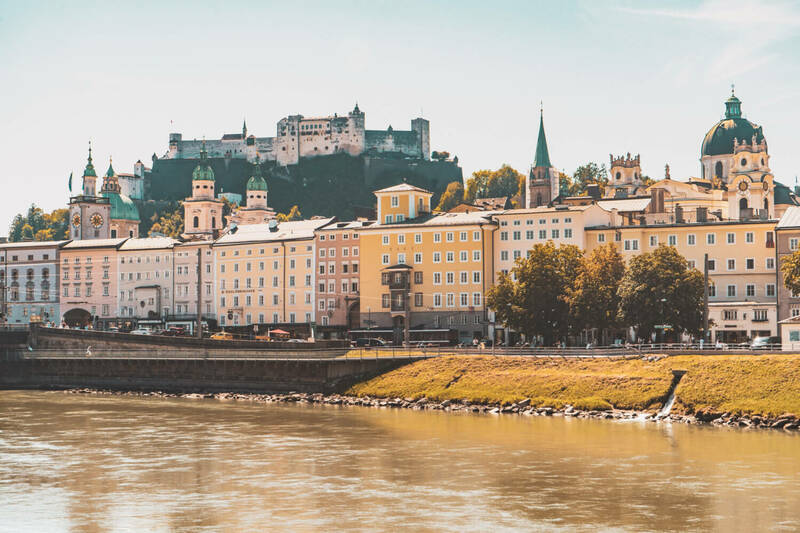 Since you’re already committing to the whole “shameless tourist” thing, you might as well enjoy some of Salzburg’s great attractions while you’re at it. 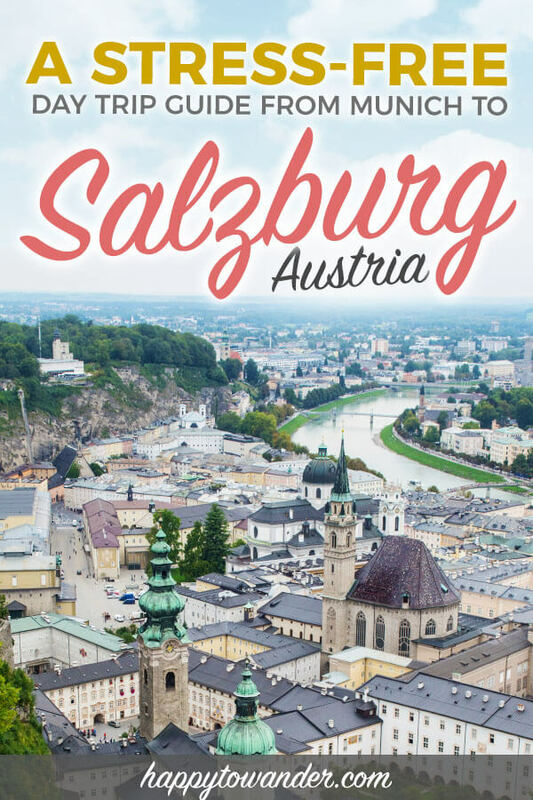 If you do plan on doing many attractions during your time in Salzburg, consider getting a Salzburg card for some serious savings. Eisriesenwelt: The largest ice cave in the world, about an hour from Salzburg. Click here to book tickets in advance. Berchtesgaden: A stunning national park, one of my favourites in Germany. The lakes here are spectacular, and Berchtesgaden itself is a very cute little town. You can get here easily by public transit, but there are tours you can book too for ease. Click here to check reviews and prices. The Eagle’s Nest: A former meeting place for Nazi officials, perched high above a mountain. This is actually located right by Berchtesgaden and you could get here by public transit quite easily, but it requires a few transfers/waiting. If you prefer a tour, click here to check reviews and prices. Hallstatt: The cutest postcard village you’ll ever see. This place has been on my bucket list for ages but I still haven’t made it there. Don’t be like me 😉 You can easily book a tour to do this day trip easily. Click here to check reviews and prices. Okay! Now that we have all the logistics out of the way, let’s get to the fun stuff. Here are some ideas for things to do in Salzburg. I know you only have one day, so don’t try to cram this all into one visit. (You can check out my sample, suggested itinerary at the end). That said, today the palace and its stunning gardens stand for a different kind of love entirely: a love of selfies! This supremely photogenic attraction is one of Salzbug’s most popular, for its beauty and of course its prominent feature in the Sound of Music. I personally adore it here (in spite of the crowds) and advise it be your first stop in Salzburg. That way, you can immediately immerse yourself in the city’s Baroque beauty. This imposing fortress that looms 500m above the city is a must visit while in Salzburg. Not only is it fully preserved, it flaunts one of the best views in town, which you can work for by walking up…… or you can do it the easy way: catching a funicular that whizzes you all the way up. Construction on this bad boy began in 1077, and today it’s recognized as one of the largest medieval castles in Europe. The Salzburg Old Town may be the busiest, most touristic part of the city, but for good reason. 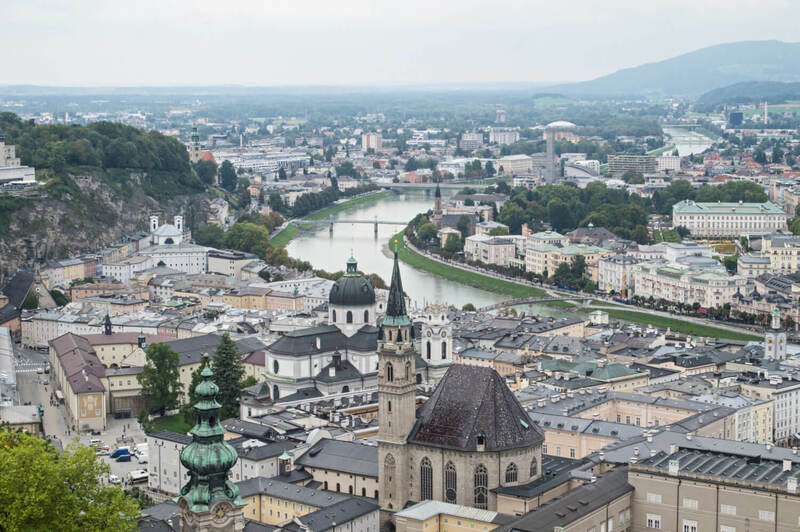 A quick stroll and you’ll soon discover why Salzburg is a protected UNESCO Heritage Site. While Salzburg is best explored and discovered through wistful wandering, don’t miss the following: ducking into the spectacular Salzburg Cathedral, strolling down the mega picturesque Getreidegasse, (and the equally pretty Sigmund-Haffner-Gasse), admiring the fountain in Residenzplatz, saying hey to Mozart’s bright yellow Gebursthaus (birth home) and, my personal favourite, admiring the postcard-perfect Alte Markt. Alte Markt – can you see why I love it? Dramatic pamphlets will declare that Salzburg is “the Rome of the North” thanks to its sheer abundance of churches… and while I’m not sure that’s the best comparison, there’s no denying that Salzburg does have some VERY good looking churches. Besides the obvious Salzburg Cathedral, be sure to stop by St Peter’s Monastery + Cemetery, the Franziskanerkirche and the Nonnberg Convent (said to be one of the oldest in the German-speaking world, and also home to Maria’s abbey from the Sound of Music). 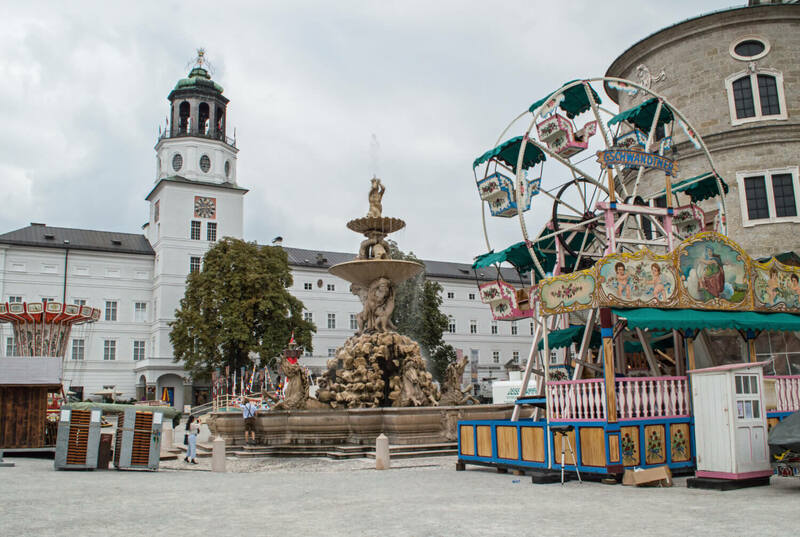 While best known for Baroque, Salzburg has a modern side that many don’t actively seek, most notably in the form of modern art installations and sculpture parks scattered around town You can learn more about the different modern art installations around the city on the official Salzburg website. Sound of Music World: Lastly, for Sound of Music buffs, the Sound of Music World is a must. In it, they bring together fiction and reality with an exhibition that contrasts the world-famous film with the story of the real Von Trapp family. Filled with prop, video installations, documents are more – I definitely have this on my list for my next Salzburg trip! Your Salzburg travel day won’t be complete without trying some beer. I mean hey, you’re not in Bavaria anymore but you’re still not safe from the clutches of central Europe’s favourite refreshment 😉 Click here for a list of beer gardens to visit. Salzburg Polaroid Tour: You get shown around by a guide while you use vintage polaroid cameras to capture your special moments (and duh, keep the photos as the best souvenir ever). Really cute idea! Learn how to make apple strudel: This delicious activity is a must if you’re eager to take a piece of delicious Austria back home with you. In this class, you learn how to perfect the art of a great apple strudel (and no doubt eat the final product afterward). Salzburg Ghost Tour: Unashamedly touristy, this is a fun alternative tour for you to take if you want to see Salzburg under a new sinister light. This tour is said to “follow the paths of witches, torturers, and executioners of centuries past” so grab your scaredy cat friends and have a night you won’t forget. A fancy dinner & Mozart concert: Lastly, if you’re looking for a truly unforgettable/magical experience, you can book this 3 course dinner set to a Mozart concert (ft. artists in period costumes). If you fancy a step back in time before stepping back home, this might the experience for you. I honestly feel like the Salzach River (the main river that cuts through the heart of Salzburg) is one of the city’s most underrated spots. I mean sure, the city’s architecture IS amazing, and there are plenty of other attractions to keep you busy, but with how busy the Old Town gets, one of the most pleasant things to do in Salzburg (in my opinion) is a leisurely stroll along the Salzach, admiring the thirteen bridges that dot the river along the way. PS: The simple and unassuming Mozartsteg is actually one of the city’s most popular, thanks to its brief cameo appearance in the Sound of Music. Kapuzinerberg: A nice spot for a little hike, offering refuge from the bustle of the city center, but a little out of the way of other main sights. The walk down from the Hohensalzburg Fortress: The view from the fortress is (in itself) incredible, but I actually prefer the views you get while walking down (or up I guess, if you’re a real go-getter). The walk over to the Nonnberg Abbey is also worth it if you have some time. 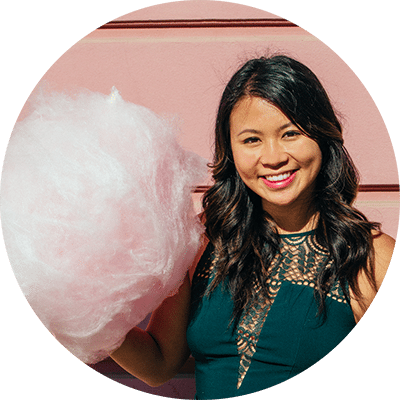 NOTE: I’m a pretty intense traveller and I enjoy squeezing the most out of every second, so this is a rather packed schedule but I promise it will help you make the most of your day trip to Salzburg! Enjoy! Following these times, you’ll arrive in Salzburg in the late morning. 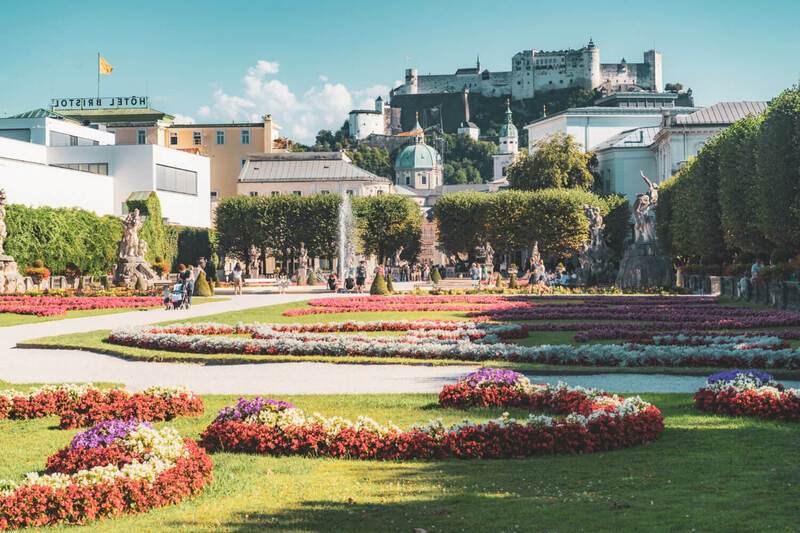 Once you arrive to Salzburg HBF, grab a pastry and coffee to go (there are lots of places inside the train station), then proceed by foot to the Mirabell Gardens and enjoy your morning treat in one of the most scenic settings imaginable. This is where a lot of the Do Re Mi scene in Sound of Music was filmed, so feel free to twirl, frolic, dance and sing your way around. There will probably be loads of people there, but I compel you to go live your best life. PS: Don’t miss the random little dwarf sculpture park right next to the garden. After you’ve properly caffeinated, on foot, continue to the Makartsteg, a little footbridge that provides amazing views of Salzburg, and is studded with colourful love locks which is either adorable or annoying, depending on who you ask. 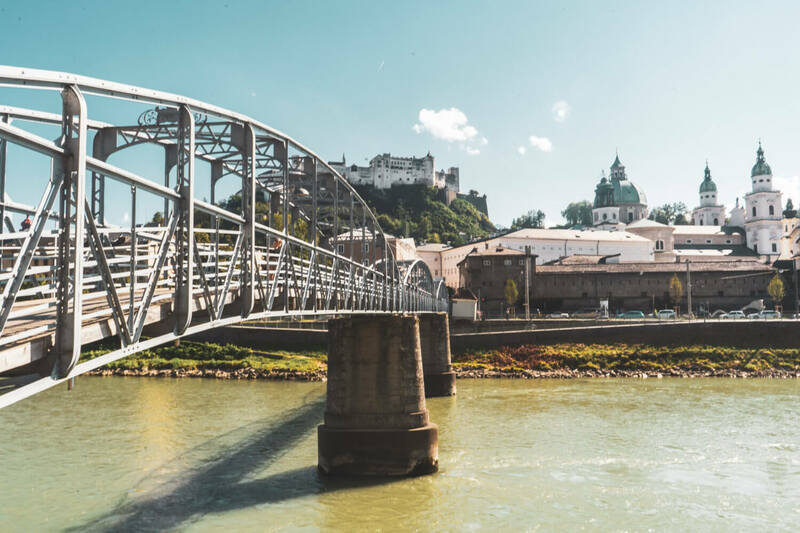 Make your way up to the Hohensalzburg fortress and work up an appetite for lunch. You can take the funicular up or brave a short but huffy-puffy walk. There’s a wonderful viewpoint while walking up, but you’ll get a great view from the fortress itself as well. I would budget about an hour to spend exploring the fortress… maybe a bit more if you don’t start to get hangry. After your visit, it’s time to have lunch! Every time in Salzburg, I’ve been non-stop go go go and usually settle for a quick takeaway sandwich. If you’re looking for something cheap and quick though, a lot of people swear by the quick eats from Salzburger Grill Imbiss and also the Balkan Grill – both of which serve up typical Austrian fast food like sausages. I would grab something to-go and find a place to sit (maybe by the river!) to relax and enjoy. Salzburg is too pretty a city to waste it waiting around in a restaurant. After you’ve finished stuffing your face, it’s time to walk off those calories and enjoy the Baroque splendour that Salzburg is known for. 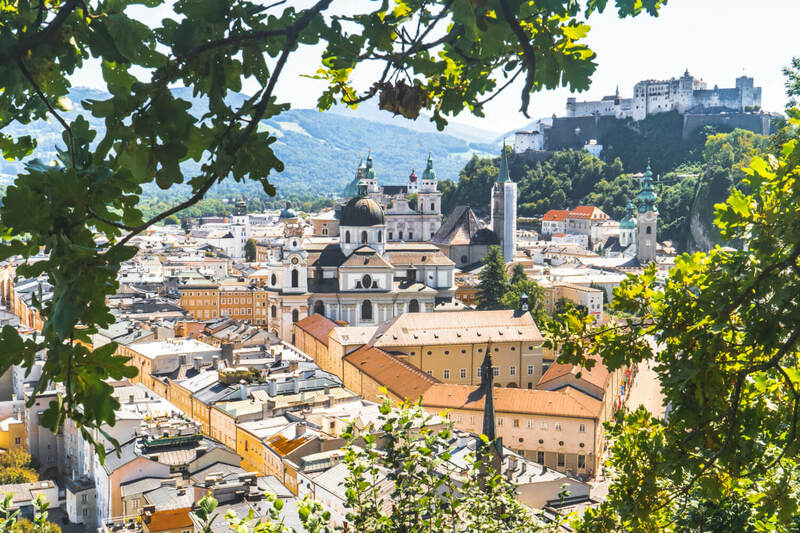 Dedicate your afternoon to slowly enjoying the Old Town, ducking into side streets and discovering why Salzburg is recognized as one of the most beautiful cities in Europe. I would definitely recommend walking away from the most congested areas, because Salzburg is best enjoyed in peace, BUT a few places of the touristy spots you can’t miss are the Salzburg Cathedral, Residenzplatz, St. Peter Cemetery and Catacombs and of course the supremely photogenic Getreidegasse. My personal favourite square is the Alte Markt – it’s just so cute. If you have time, I’ve heard the DomQuartier is well worth the admission fee. Click here to reserve a ticket in advance. After so much exploring, I think you’ve earned yourself a drink. 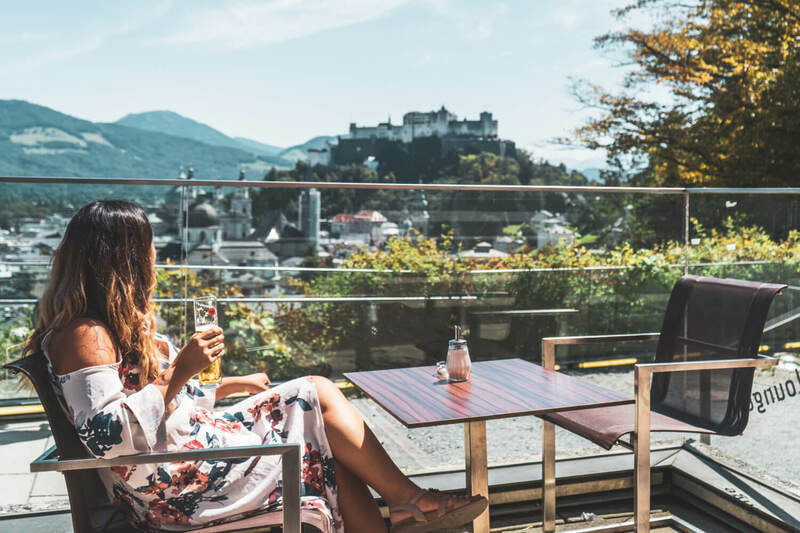 If weather allows, why not enjoy one of Salzburg’s beer gardens, or for something a little more “upscale”, proceed to M32 for a sunset drink with a spectacular view. For dinner, stop by Augustiner Bräustübl, a Salzburg institution. Or I can also recommend Triangel, which is more intimate but very cozy and delicious. Then, after you’re (presumably) too full to move. Catch the train from Salzburg to Munich at 9:15pm and be back in Munich by 11:15pm. Promptly faceplant into your bed and enjoy a good night’s sleep. *sobbing* don’t make me leaaaave! Do you have any more questions about doing a Munich to Salzburg day trip? I feel like I’ve thrown enough information your way, so all that’s left is to wish you an awesome trip! If you have any more questions about what I’ve written above, feel free to leave me a comment. Safe travels!